I love this article from @DougSundheim as I have always been focused on finding solutions to common problems that can scale. The author suggests writing down all the things that frustrate you in a day and then understand how critical it is to fix them. Often it is the simple things that can scale. Enjoy and let me now any things that really frustrate you during your day to day life. In the late 1990’s/early 2000’s, Woodman blows $4M of VC money on a failed venture called funBugs.com, an ultimately ill-conceived loyalty, sweepstakes, and entertainment website. In 2002, unsure of what to do with his life, he takes off to surf in Indonesia and Australia. He wants to capture live-action shots from his surfboard. The only cost-effective way to do this is by strapping a disposable camera to his wrist with rubber bands. Not surprisingly, it doesn’t work well. Back in the US, unable to find a suitable camera wrist strap, Woodman sets out to develop one himself. He quickly realizes it would make a better product to include the camera too. Meanwhile, he has no knowledge of cameras. It takes him two years to find and prototype the right camera. He bankrolls his efforts by selling shell necklaces and getting a small loan from his mother. The first camera comes out in 2004. He sells it door-to-door to surf shops. It’s a hit. He then develops a video camera that debuts in 2007. It’s also a hit. In the years that follow, he develops increasingly cool yet affordable cameras with pro-like, wide-angle HD video. By 2013, GoPro, with a mission to “capture life’s most exciting moments,” has the best-selling camera in the world and around $1 billion in yearly sales. I love Woodman’s story. Beyond its obvious compelling arc, it reminds me of how important it is to live the questions right in front of us—and not waste time looking for big ideas “out there” somewhere else. The questions that annoy, frustrate, or bother us are our greatest opportunities. They poke us and get under our skin. We’re naturally motivated to solve them. To live a question is to commit to it—to explore it even though we’re not sure where it will take us. We explore it because it’s interesting, meaningful, challenging, and often fun. We also explore it because we know that even if we fail, something good will come from it. We’ll learn something important. Or at least have a great story to tell. Why are children’s car seats so tough to install? Why do so many consulting firms underwhelm their clients? Why has that beautiful building on such a desirable corner been abandoned for so long? What’s really going on with the massive vacant waterfront in my town? What’s the connection between poetry and great leadership? How come every time I write marketing copy, it sounds boring when I look at it the next day? Why can’t I find a stylish, warm, winter coat without a hood? How can I find more time to read? It’s not an earth-shattering list, just simple seeds of ideas. That said, the exercise turned out to be far more insightful than I had anticipated. First, I didn’t realize how many questions cross my mind each day. I was micro-brainstorming all day—and probably have been my whole life. I’d just never noticed before. Second, the process changed how I saw the questions. The mere act of writing them down reframed them from random thoughts into potential opportunities. It pulled me out of a problem orientation and put me into a solution orientation, which is a more powerful way to live. For example, I didn’t have to just complain about car seats; I could explore mechanisms for making them easier to install. There might be good reasons why the process is such a pain in the neck. But then again, there might not be. After all, before Woodman developed a wearable camera, there wasn’t a good reason why that didn’t exist yet. We tend to think that the problems we see are so obvious that people smarter than us must already be working them—so why waste our time thinking about them? But often that isn’t the case. There are countless reasons why seemingly obvious problems go unsolved. One of the biggest reasons is that people best positioned to solve them often have vested interests in not solving them. Perhaps above all these questions is a larger one—how do we choose which questions to pursue? If I wrote eight questions a day, that would be close to 3,000 a year. You can’t do anything with 3,000 questions. But here’s my hunch: patterns in our questions show up over time. We keep wondering about the same or similar things over and over. And those patterns are gold because they point to our motivation—and quite possibly, our next great exploration. So here’s my plan. Over the next year I’m going to take 10 minutes per week to write down the interesting questions that cross my mind. At the end of the year, I’ll review the 52 lists for patterns and themes. And by January 2015, I’ll see where I end up. Maybe I’ll have something worth working on. 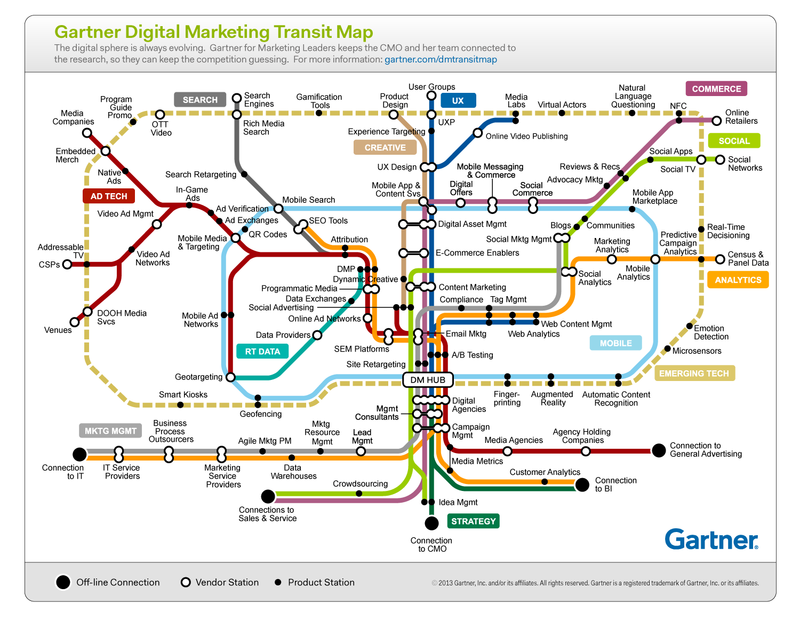 In the competition for the best visualization of the kaleidescopic marketing technology space — other entries include my marketing technology landscape from last year and themarketing technology LUMAscape from last month — I’d say Gartner has just jumped into the lead with their new digital marketing transit map. Their high-level map is visualized around types of products and services — represented as stations on the map — rather than the individual vendors themselves. However, Gartner has cataloged more than 1,800 vendors to create this map. It’s pretty breathtaking in scope. There are 12 tracks, such as Marketing Management, Creative, and Analytics, which share common objectives and information. And they go through 7 neighborhoods, such as Marketing Ops, Web Ops, and Ad Ops, which are typically different practice areas within an organization. And there are offline connections to sales and service, general advertising, business intelligence, IT, and the CMO’s office. All lines converge in a “digital marketing hub” — the central DM HUB station — in the middle of the map. Looking at this map, you cannot help but be awestruck by the breadth and depth of digital marketing. I mean, holy cats, I work in this space for a living and write this blog as my hobby — I know, I don’t get out much — and I don’t even know some of these stations. Many of them I have only a passing familiarity with. In spite of huge deals such as Salesforce/ExactTarget and Oracle/Eloqua, it’s clear from this map — remember 1,800 different vendors were cataloged to assemble it — that marketing technology is diversifying more than it is consolidating. The Emerging Tech track alone is a source of incredible disruptive innovation ahead. So I can fully empathize with — and have enormous respect for — marketing leaders who are struggling to sort out a cohesive strategy in this landscape. Nobody can master all of these. The real lever you have is to decide which stations you’re going to prioritize. From my post last week, this is Martec’s Law: technology changes exponentially, but organizations change logarithmically. The art of marketing management is the strategy you use to choose which changes to focus on, and which ones you intentionally let slide, at least for the moment. And successfully implementing that strategy is far more about people and processes than it is the technologies themselves. Which leads me to my main takeaway from this map: the “trains” are people. There is no technology that delivers the seamless interconnectivity between these stations as it’s portrayed here. You can’t just hop the Ad Tech red line to get from native ads to attribution, transfer over to the Analytics orange line, and arrive at predictive campaign analytics in an easy 20-minute ride. The connections between these disparate stations are made via human collaboration — people and processes. It’s messy and evolutionary and varies tremendously from one organization to another. Most of all, there is no “DM HUB” technology today that seamlessly merges all these tracks together into the marketing equivalent of Grand Central Station. Sure, there are companies and service providers that are bringing a subset of these pieces together. But most of their strategies to date have been implemented as marketing suites rather than marketing platforms — which is like trying to hold back the ocean with a sandcastle (albeit a very elaborate one). The digital marketing hub is an organizational entity, not a technological one. But even in that light, this map from Gartner is extremely helpful because it visually raises the question: how are you bringing these neighborhoods together in your company? What does your digital marketing hub look like today, and what are your plans for expanding it to handle the massive influx of population ahead? Understand what’s in it for you to motivate yourself. Brainstorm how working on this tough behavior — networking, perhaps, or public speaking — can advance your career or help you reach other goals. Then, customize a plan to take control of a situation instead of being overwhelmed by it. If, for example, you’re an introvert who dreads networking events, instead of feeling pressured to meet everyone, focus on a few people and actually try to get to know them, or aim to make initial contacts with the goal of following up in a more comfortable setting. 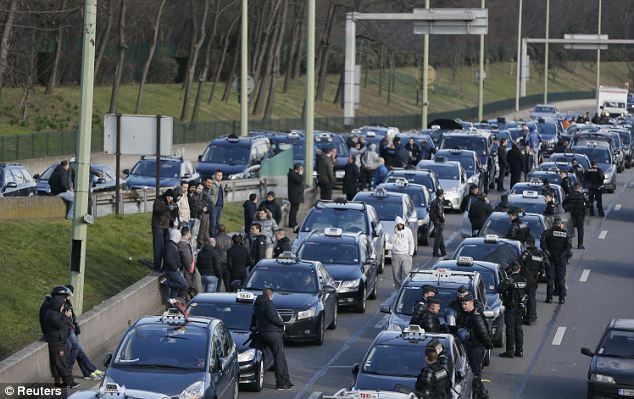 A one-day taxi strike snarled rush-hour traffic in France’s two largest cities on Monday with drivers protesting competition from unregulated cabs in a battle that underscores tension over efforts to liberalise protected French markets. 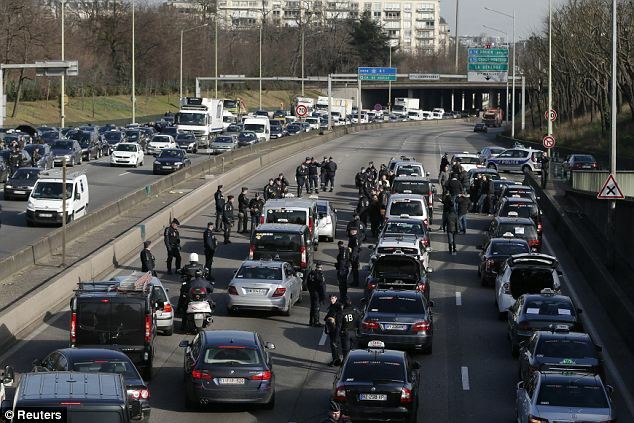 Taxi drivers in Paris blocked highways leading from Charles de Gaulle and Orly airports into the city centre, while traffic was paralysed on two main arteries leading into Marseille. 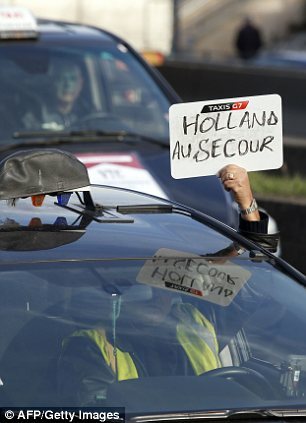 The protest marks the second such show of force in two months and is a challenge for the Socialist government of President Francois Hollande, as taxi drivers cry foul over what they call unfair competition from vehicles-for-hire that are often cheaper and not subject to the same regulation. 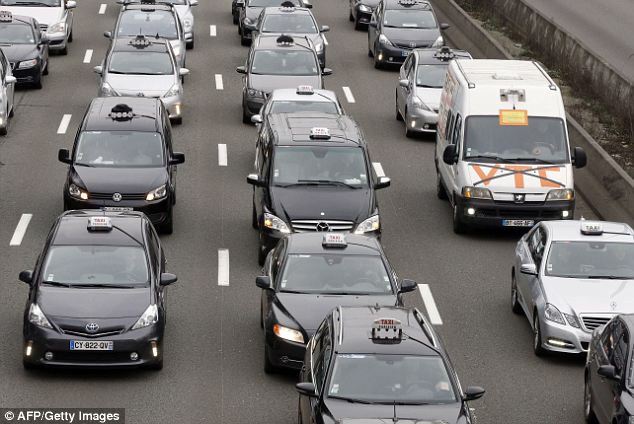 Television images showed taxis parked in highway lanes and angry drivers waving their licences which cost about 200,000 euros ($272,400), a cost their competitors do not pay. 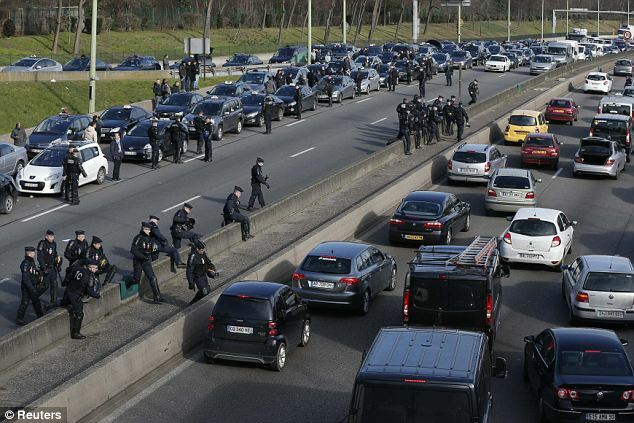 ‘Mr Hollande, we’re very determined,’ driver Ibrahima Sylla told BFM-TV. ‘We’re here, we’ve got all our colleagues here…we won’t let up. The general secretary of the Force Ouvriere-UNCP taxi union, Nordine Dahmane, said deregulation threatened ‘hundreds of thousands of families’ who depend on the taxi industry. ‘We’ve got to protect it,’ he said. With 19,000 taxis, Paris has fewer today than it did in 1920. The limited supply is just one symptom of competition-killing rules and red tape that limit access to dozens of professions and which Hollande has so far been reluctant to tackle. 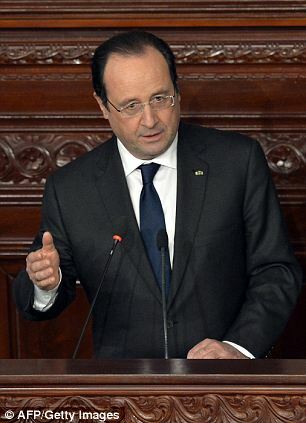 On Saturday, Interior Minister Manuel Valls said the government would create a committee soon to study the matter. 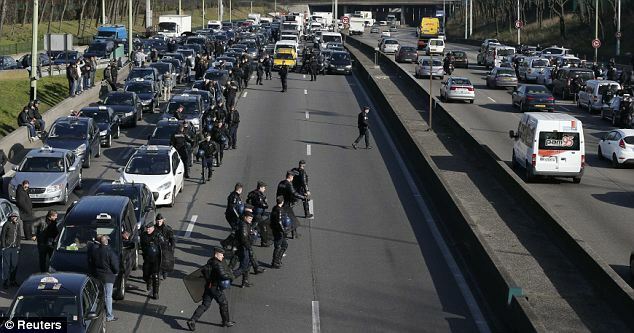 Monday’s strike was called to protest last week’s ruling by the Conseil d’Etat, France’s highest administrative court, that struck down a government provision requiring the unlicensed cars to wait 15 minutes between logging a reservation and picking up passengers. The move angered taxi drivers, who say that even with the 15-minute delay consumers were gravitating to the competition. They call for an artificial delay of 30 minutes and a minimum fare of 60 euros. Visitors to Paris frequently complain about a shortage of taxis during peak hours, a side effect of limits on the number of taxi licences that can be issued each year. Competition from the vehicles-for-hire, whose drivers do not need to undergo the same training nor pay the hefty price for an official taxi licence, has infuriated taxi drivers. The European Commission has long pressed for France to open its many protected professions to greater variety and competition, citing excessively high barriers to entry for taxi drivers as one area especially ripe for deregulation. 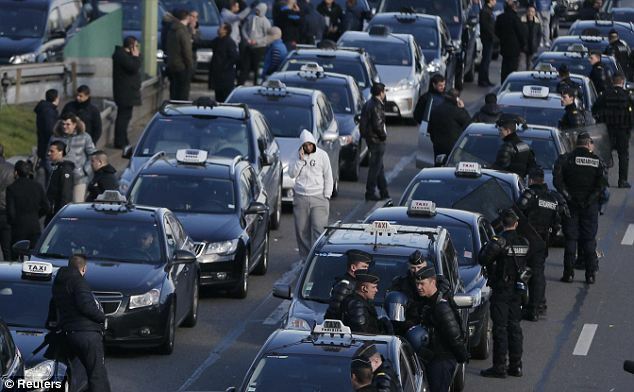 Generations of French leaders have backed down from deregulation in the face of taxi strikes. 2014 starts very BADLY on the RER B with 68% of days with problems in January , the highest since the beginning of 2013, or put another way, 15 wasted days out of 21 days. It has been particularly intense moments , including the day of January 15 , with a failure every day . 71 % of problems due to the running of the line and 29% for travellers. Can it get any worse? We’ll know in the next episode . February is actually brighter with its 15 days of school holidays , but we reserve judgement on March? Should we call the ” Super Tube ” to the rescue? The only benefit is for @UBER who gets passengers at a higher price, more profit and phenomenal free publicity. L’année 2014 commence très fort sur le RER B avec ses 68% de jours à problèmes en janvier, un record depuis la création de ce blog, soit 15 jours bien pourris sur 21 jours ouvrés. On a connu des moments particulièrement intenses, notamment cette journée du 15 janvier, avec sa panne de caténaire (journée de galère), apogée d’une semainetotaly fail. Soit 71% de problèmes imputables à la régie, et 29% aux voyageurs. Comment pourront-ils faire pire ? On le saura au prochain épisode. Février est de fait plus prometteur avec ses 15 jours de vacances scolaires, mais que nous réserve Mars ? Faut-il appeler les « Super Métro » à la rescousse ? An interesting week that highlights the dream and the reality of where we are with digital……. Companies and Brands need to make more of an effort to use all the data at their disposal to intelligently engage with their customers who have every right to feel hard done by through not being cared for or acknowledged in an age where they are the ones informing the company of their issues. Roles are reversed. Now its the turn of the consumer to be king, not content. The decision making power is totally in the hand of the mobile consumer. By mapping out better consumer target segments, brands can push out more personalized experiences and messages on their websites, in social media, on mobile, and in retail. For instance, car dealers will now be able to reach someone who has specifically browsed or liked a certain make/model of car on an advertiser’s website or Facebook property and who has shown behavior that he or she will soon purchase a vehicle. We saw a ton of real-time marketing recently during the Oscars and Super Bowl where a good majority of the real-time efforts felt like spam. Brands like Kellogg’s, Stella Artois, and U.S. Cellular jumped on the bandwagon, pumping out generic tweets and images about the Oscars and mass broadcasting them via social media. None of it was very interesting, personalized, or targeted to a brand’s high-value customer. Brands that make the leap into real-time marketing and engage with their most influential customers in a personalized way will have a decided advantage over competitors. As discussed by Bill Lee in “Marketing Is Dead,” in the past, the definition of customer lifetime value (CLV) was based only on a consumer’s purchases. In the future, with the proliferation of social media, a customer’s CLV will have to factor in the influence the customer wields over their social networks and ultimately how much that influence drives others into a transaction with a specific brand. This social factor will be weighted by reach (number of connections in the social graph), frequency (amount of sharing), impact on others (overall or for the category), and individual engagement with the brand. With this updated calculation of CLV, a brand must have a 360-degree view of the customer. Brands will want to spend more time engaging and dialoguing with customers who have a higher CLV. Though digital channels continue to proliferate and consumers continue to distribute their time spent with a brand across this fragmented landscape, most brands are still using outdated tactics to reach the masses. Some advertisers are creating a virtual landfill that makes it difficult for any message to resonate. To surgically cut through the noise, advertisers need to develop richer customer profiles. It’s not the sexiest of topics in advertising, but it’s one that will ultimately allow brands to target and personalize the experiences and messages that consumers deserve. We like to be greeted by our local butcher by name and yet when we go to supermarket and spend 10x the amount that was spent at the butcher, we are not even thanked personally, even when we give the checkout person our loyalty card to recover points that actually are not at all motivating or incentivising. While Foursquare may be more accurately described as a platform, it did excellent job of promoting itself this past year with infographics.Foursquare’s Time Machine — co-branded by Samsung’s Galaxy S4 — created stunning visualizations of users’ check-ins. The company also used its check-in data to show the “pulse” of select major cities — where and how people check in throughout the day. Although Foursquare is not a publisher, it found creative ways to illustrate its data to users and advertisers alike. More and more I see and hear of examples where certain departments or even individual teams are working and struggling in isolation to the rest of the company. Are you really working on something that will really make a difference for your customers or are you spending time just working on the same set of objectives and activities just because you are stuck in a repetitive set of reporting requirements. Are you really making making a difference to your customers based on what they want not what you think they want. Does the dept next door know what is your value add and how together you can really delight your customer. How is social media and the feedback from customers circulated and analysed to provide real insights on what should be done, not what you think must or assume has to be done. Make an effort to get to know others in your company and what they are doing and how you can help engage and improve the experience of your brand with its customers. How do you share information with the rest of the company? So many reports are completed (I have been told that some people in companies even spend 40% of time just on internal admin) but who analyses and discusses the real live customer info to create insights that can be acted on. Stop working in silos. Start sharing and working together and get to know your customer. Experience is the new currency of the digital economy. This blog will be a window that opens into this new ecosystem and highlights, explains and ultimately informs about how digital affects or could affect the engagement of brands with existing and potential customers. Experience Digital is about putting the customers first and ensuring that they are serviced with relevant and engaging content across the multitude of channels that they use or are exposed to. Its not about selling. Its about delighting the customer. It’s about the customers and their experiences being put first and not the brands. The new digital disruptors are not new technology initiatives but how a customer interacts behaviourally and leads his/her life within this brand new world. Experience Digital is about how the customer can continue or even improve his/her life within the digital environment that he/she now finds herself in. Its the beginning of a new wave and lets see where the surfboard we are riding will take us. For sure it will be bumpy but also will hugely exciting and fun.